You are currently browsing articles tagged white house beer. I want to taste the white house homebrew, so I’ve done what any red-blooded American would do: I’ve started a petition. NPR tells me that Obama is cruising the country with homebrew and handing it out. While the president “doesn’t exactly hover around the carboy with a thermometer, agonizing over alcohol levels,” which I find somehow disappointing, perhaps it’s best for the beer, and the country, that the white house kitchen handles the brewing. My question (and yours I’m sure), is how can the public get their hands on a bottle? 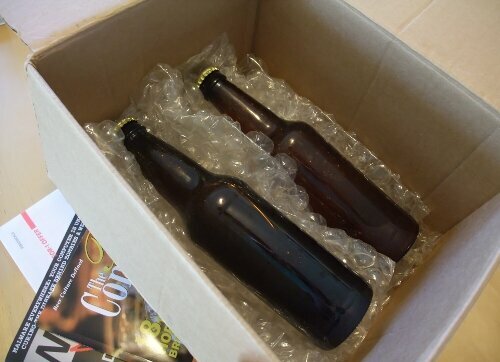 The answer is simple: a good old homebrew trade by mail. You send the White House a bottle of yours, they send you a bottle of theirs. I’ve started a petition to make it happen—Trade White House homebrew through a mail-based homebrew exchange program. Sign on, we only need 24,999 more people to get this homebrew petition rolling!